Vaigu der'e, vinohu'e, sabu ahe ohu'o mokoje an'e. Design of the bush snail, design of the bellybutton, spots of the wood-boring grub, tattoos and beaks of the parrot. Ilam Savari has painted vaig'e, the design of the bush snail. The central circle represents the bush snail shell. The shells are usually found in the rainforest, and were used in the time of the ancestors for the important social custom known as haiwu'e, the chewing of betelnut. This custom is practised in everyday life but especially during feasting and dancing after ujawe initiation tattooing rites as well as for marriage ceremonies. The shell would be ground up into a powder, similar to lime powders used today, and then chewed with the fruit of the betelnut. Lytis said that the betelnut-chewing induces a trance-like state in the dancer. A number of ujawe sore (initiation tattoo designs) can also be seen in the work, including the diamond-shaped design, vinohu'e; tattooed around men's naval during the ujawe' initiation rite. Vinohu'e literally translates to 'design of the bellybutton'. This design is sometimes also referred to as siha'e, fruit of the sih'e tree. Sihe is a yellow fruit found in the rainforest and often eaten by cassowaries. In the time of the Ancestors during times of tribal warfare, the Omie male warriors had no food while they were defending their borders in the forest far from their village so they survived by chewing the sihe fruit, swallowing the juice and then spitting out the pulp. Surrounding the diamond-shaped vinohu'e design, the solid black zig-zag/sawtooth design, taigu'e taigu'e, pattern of a leaf. The curly ends of the taigu taigu'e are odunaigo'e, a climbing jungle vine with thorns and tenrils. The solid black saw-tooth triangles which can be seen inside the lines radiating from the central, circular bush snail shell design are mokoj'e an'e, beaks of the parrot. The dot design is sabu ahe, representing the spots of the wood-boring grub which can be seen on the sides of the grub. This grub is sacred to Omie people as it plays an important part within the creation story of how Huvaimo (Mount Lamington) came to be volcanic. It is traditional soru'e (tattoo design) which was most commonly tattooed as a band of spots under each eye. Today it is applied to Omie people's faces for dance performances with natural pigments. 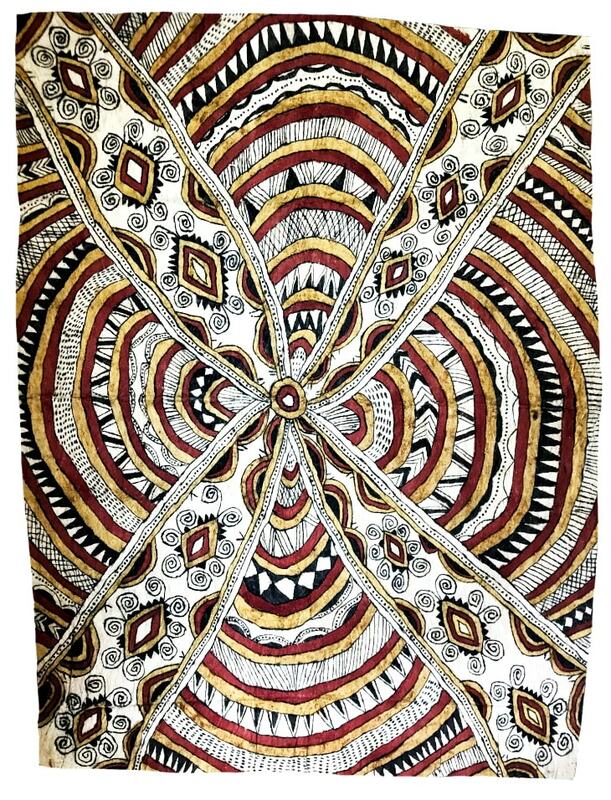 It is important to note that the high level of detail in this work comes from the strong influence of Ilma's mother and nioge (barkcloth) painting teacher, Sarah Ugibari, a highly respected elder. As with most of Ilma's paintings, there is a fusion of both Omie and Managalasi designs.